Native Americans embraced this great bird as a symbol of spiritual power. Its ability to soar high above the mountains while bathed in brilliant sunlight made them 'the great Messenger of the Gods'. Native tribes on the plains believed that the Eagle was the earthly incarnation of the Thunderbird spirit, embodying thunder and lightning. In 1782, it was incorporated into the US constitutional seal, but if Benjamin Franklin had his way, the turkey would've been the national bird instead of the Eagle. Can you imagine a turkey being painted on the side of Air Force One? A Tribal Eagle tattoo is deeply rooted in the traditions of various Native American clans. Tribal tattoos have spiritual significance and represent the strong ties of the clan with the natural elements and their respective deities. The Eagle in these tattoos usually has a powerful presence which is used to infuse the design with elements of Power and Strength. Haida Eagle tattoos originate from the oldest Native American tribe in North America, the Haida, who live in British Columbia, Canada, and Alaska. The Eagle in Haida culture is a representation of the Great Spirit and embodies Power, Spirituality, Wisdom, and Strength. Haida Eagle tattoo designs are usually red or black and are a special type of Tribal Eagle tattoo. The double-headed Eagle comes from Sumeria (modern day Iraq). It was eventually brought to Europe and Russia by Turkish traders and pilgrims during the Crusades, and adopted by the Orthodox Church. The symbol spread like wildfire throughout Europe when many countries aligned themselves with the powerful Church. Today, it is incorporated into the official seals and flags of many European countries, including Albania, Armenia, Serbia, and Montenegro. The double-headed Eagle tattoo symbolizes Power, Strength, Dominance, and Honor. 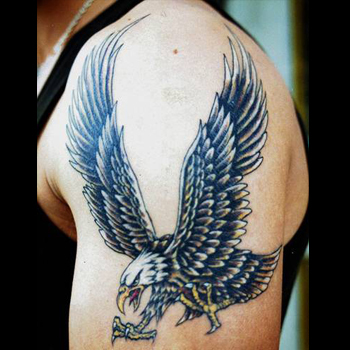 A popular variation of this design is the Albanian Eagle tattoo. In Native American culture, an eagle's feather represents Healing and Medicine; in fact, many of the tribal rituals incorporate its use. This tattoo design shows a bond to Nature, Native American heritage, and the spiritual elements. By law, only members of recognized tribes are allowed to have an eagle's feather in their possession; anyone else caught with this rare item will do hard time and pay a hefty fine. But you can't get arrested for having an eagle feather tattoo! The Eagle Claw is much more than a martial arts technique. The talon symbolizes protection of the wearer from evil and the destruction of, and power over, evildoers. That's why an eagle usually grips a snake with its talons during their battles. It is also a symbol used in Heraldry. The Snake is one of the oldest creatures in mythology and is a representation of Sexual Passion, Temptation, Vindictiveness, and Vengefulness. Snakes are also associated with poison and the Greek God of Medicine, Asclepius, which explains why it is the universal symbol for Medicine. Normally, this tattoo represents Conflict. An Eagle and Snake tattoo symbolizes the struggle between Wisdom and Passion, Morality and Vengeance. As the official insignia for the US Marine Corps, the Eagle, Globe, and Anchor tattoo design features three key elements that represent the Corps commitment to a higher cause. The Globe symbolizes the US Navy's willingness to be of service to the world, the Eagle represents the United States, and the Anchor pays homage to the country's rich naval history. This tattoo is popular with loyal Marines who are dedicated to the greater good. Semper Fidelis (Always Faithful). Even when soaring high in the clouds, the Eagle is able to single out prey on the ground. An Eagle Eye tattoo represents Clarity, Bravery, Vision, and Focus, all of which are needed to see things beyond the obvious. In the presence of obstacles and danger, i.e. when the bird flies into blinding sunlight, the Eagle is unwavering. As such persons who are faced with extreme adversity and obstacles opt to get an Eagle Eye tattoo design since they identify with the bird's resilient spirit. Eagle Wings embody Freedom and Protection. The Eagle soars high above the mountains and through the valleys without any restrictions. These tattoos also have a spiritual element; a soaring eagle is believed to be a representation of the Ascension of Christ after his crucifixion. Eagle Wing tattoo designs are popular among people who have a need to be free and unrestrained. Choosing the right tattoo design can be difficult, but it's best to find symbols that speak to your personality or individual situation. In 20 years, you want to look at your tattoo with fond memories and a sense of pride. If you need some inspiration, then visit our design page at www.itattoodesigns.com or take advantage of our Custom Design Service, where our team can create a truly unique piece for you.